METAGAL now on available on Nintendo Switch,PS4,Xbox One and PS Vita! Thanks to our partner Ratalaika Games! We are pleased to announce Metagal now avaiable on your favorite games console of choice! Nintendo Switch, PS4 ,Xbox One and PS Vita! Game DescriptionWhen those you Love have been taken and a Maniacal Fiend wishes to take over the World, You need a Hero of a different calibre. You need a hero, like METAGAL! Features– Classic jump and shoot style platformer. 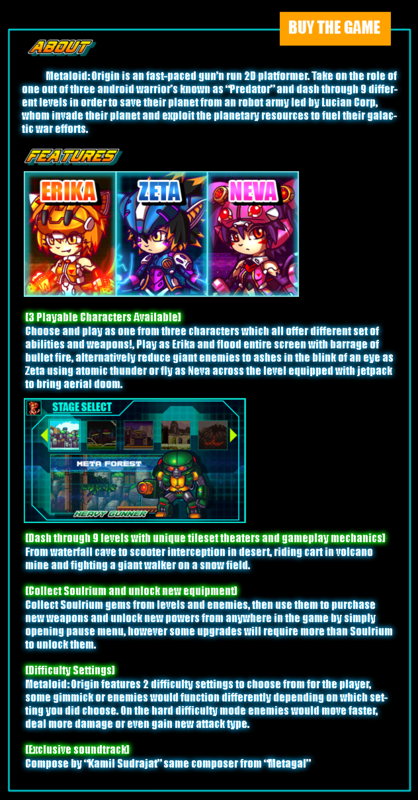 – Unlockable new characters to play wi, each come with their own powers and upgrades. METALOID: ORIGIN now Available on steam!